Mommy's Favorite Things: Some pictures!! Emerson is growing up right before my very eyes!! Here are the kids on Easter! Picture of a picture. The original is better quality! Just set it up today and he LOVES it!! Comparison. Avery at just shy of 3 months and Emerson at 3.5 months. His face is fuller, but they certainly resemble each other. Looking back I realize just how many freckles I've lost!!! Now you all know where my kiddos get their eyes from! Click on this picture to see it larger! There's the update!!!! So many pictures. Time sure does fly! Emerson and Avery both go to the dr on May 7th. He'll be 4 months on April 28th and she'll be 5 (YES 5!!) on May 9th. At this point I'm assuming he's 14 pounds and about 24-24.5" long. He's getting big! 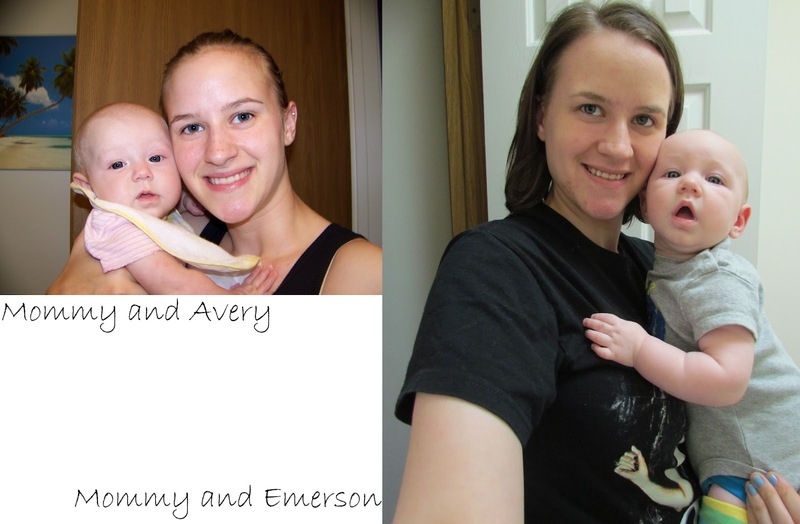 Emerson and Avery do resemble each other alot. Emerson is such a cutie. I love, love Avery's hair style. It makes her look all grown up. I love the Easter pictures. Thanks for sharing Heather and you have a beautiful family. Thank you, Gina and Rachel!